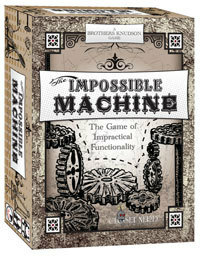 The concept behind the quick-playing filler Impossible Machine has its roots in the incredibly unnecessary mechanical creations of Rube Goldberg; but for some reason when I play this game I keep hearing the Breakfast Machine music from Pee-Wee’s Big Adventure by Danny Elfman. Anyway, up to 5 players are given a deck of cards that consists of random bits and pieces to use in the creation of an impossible machine, along with a few eradicate cards thrown in to mess with your opponents. The Game – Setup is pretty quick and easy; each player selects a colored deck, shuffles up, and draws a hand of 7 cards. On a turn a player can play three cards; all three of these cards can be components of the machine or an eradicate card that wipes out a card of the machine and allows you to replace it. 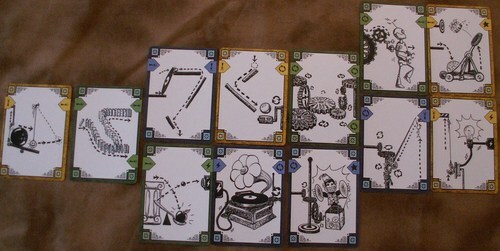 Each component card has an input type and an output type—levers (up and down, push or pull), gears, and electricity. When playing your component cards the input of the card played has to match the output of the card it’s played next to. Some cards split their output and allow the machine to grow in different directions. Players can also insert cards into the machine again provided that the inputs and outputs match. The final type of card is a Catalyst card, these are the cards that give the machine its purpose. Once a player attaches a catalyst to the machine it sets the machine in motion on the end of the next players turn (assuming of course, that player hasn’t eradicated the Catalyst). Once the machine is in motion, at the end each player’s turn—starting at the beginning of the machine—three cards are turned face down. As long as cards are face up they can be eradicated and replaced, or cards can be inserted in between them. Once all the cards are turned face down the round ends, and players score a point for each of their cards, and 2 points for each of their Catalysts in the machine. The player with the must points after three machines wins the game. Did I Like It? To be honest, it feels like there’s a lot missing from the game. The theme of the game is interesting for sure, and has its charm, but the game itself seems sparse. And often just a turn or two into building the machine a Catalyst seems to show up and leave everyone scrambling—or that one player who had a bad draw completely out of the round. I know it’s a filler game, and it’s meant to be light, but to me it felt Uno-ish. It does require some strategizing to plan out a turn in advance, but even those best-laid plans can be dashed pretty quickly. I’m not completely giving up on the game, but it’s not the engaging experience I expected from it—even for a filler. Thanks for reading our little blog!